The B-500 Transportable Pipe Beveller produces high quality bevels in 45 seconds* without flames or sparks. The compact design quickly mounts to pipe 4” and up with a maximum wall thickness of 1/2”, and creates consistent bevels in a single pass. *Timed on a 10” Schedule 40 Pipe. Set-up and bevel 10" diameter schedule 40 pipe in 45 seconds! Pipe is cool to touch immediately following bevelling. Accurate bevel angle around diameter of the pipe allows for optimal number of cover passes. Adjustable land width from 0" to 3/16" to fit welders’ requirements. Produces a machined finish due to 6 replaceable cutter inserts working simultaneously. Fast to set-up and operate. Patent-pending clamp system firmly secures tool to the pipe. Speed monitoring with led indicators for optimal cutter performance. Capacity 4” pipe and larger, flat plate. Pipe Wall/ Plate Thickness Min 0.188" (4.8 mm)/Max 0.50" (12.7 mm). Models Equipped with – 37.5°; 30° or 45° (with Optional Cutter Heads). Cutter Head Rated for most steel & stainless steel*. Size 15.8 in. (401 mm) L x 11.5 in. (292 mm) W x 13.3 in. (338 mm) H.
Land Width 0" - 3/16" (4.8 mm) in approximately 1/32" (0.8 mm) increments. Motor RPM 950 (no load). * Beveller cutting head and inserts are optimized for standard A53 mild steel pipe. Reduced insert life can be expected on other materials. B-500 Transportable Pipe Beveller is rated 5.0 out of 5 by 2. Rated 5 out of 5 by charlessr from Pipe beveler B-500 use Watched the on line video, decided to buy product. Simply the best large pipe beveler I have seen in 15 years of pipe work. Used "portable mill" type before but this unit out performs all. Easy to use, quickly completes task, does a great job. The land setting is excellent. Definitely would recommend product. Rated 5 out of 5 by magnum from great product easy and simple to use. light weight, pretty much self explanatory. great for the pipe beveling it was meant to do. i would recommend this product to any pipe fabricator in the profession. so easy and simple. 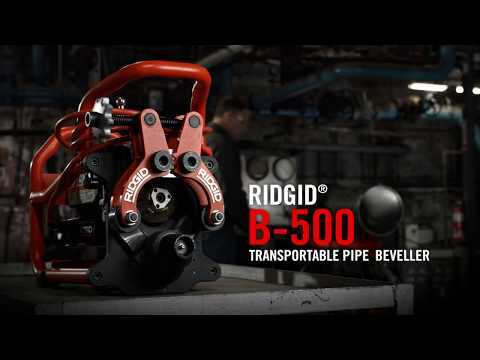 Is it possible in the future, Ridgid would make cutter head use on B-500 for cut groove on pipe? Thanks for writing to us! Our product teams are always working on new products based on customer demand. We'll be sure to pass your idea along to them for future consideration! Hello! Thank you for your question on the B-500 Beveller. The Beveller can be used on elbows, but it depends on the elbow and if there is enough flat surface for the clamp rollers and drive roll to run on. If you have further questions, please don't hesitate to contact our Technical Service department at 1-800-769-7743. Thanks! Can &quot;J&quot; groove preps be done with this machine? Looking for a machine to prep a 20&quot; diameter pipe for AWS D1.1 B-P8-GF weld.